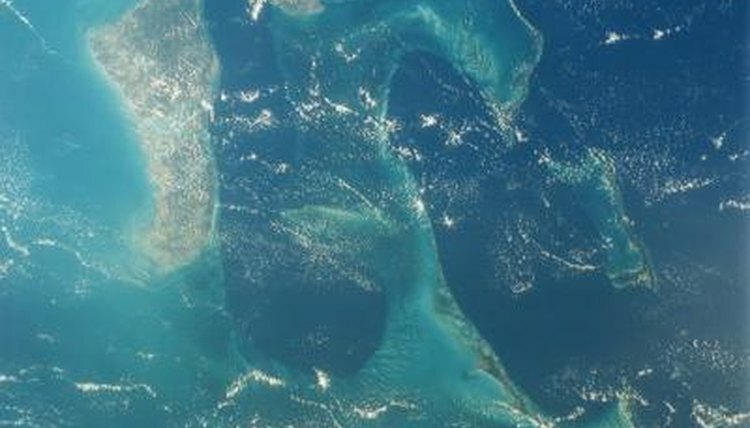 The Bahama islands are a fascinating place for fish. The many reefs and warm waters in that region, which includes the southern coastal areas of the United States, provide a multitude of unique fish specimens. There are several that claim the title of “flesh-eating,” which doesn't necessarily mean dangerous or man-eating. A flesh eater is just a carnivorous fish that eats other fish. With 18 venomous spines on his body, the red lionfish is a dangerous threat to bigger fish trying to eat him. In humans, the toxin creates severe pain and swelling. This fish is considered quite the delicacy and is safe to eat, as the venom is only in the spines. Lionfish are colorful and beautiful fish that feed on fish smaller than themselves. Red lionfish are not endemic to the Bahamas but come from the Indo-Pacific. Great barracudas are lone hunters with very wide mouths and long, sharp teeth. These predatory fish eat a number of different types of fish from all water levels, including small tuna, mullets, groupers, snappers and herrings. Great barracudas eat fish larger than themselves by biting the bigger fish in half. They are daytime hunters, sleeping at night and following prey by sight. These fish live in shallow waters but hunt at any level. This grouper is one of the largest of the reef fish from the Bahamas. It feeds on smaller fish, including parasite eaters such as shrimp and the pilot fish. This grouper feeds during daylight and hunts in seclusion. Nassau groupers are long-lived, able to survive around 20 years in the wild. These fish swim in both shallow and deep water, often coming close to shore in some places, and always stay near the reefs. Pilot fish spend much of their time following sharks around, eating the various parasites that live on the sharks' skin. These fish also clean up the mess when the sharks have a meal, by eating all the leftover pieces. These carnivorous fish are part scavenger, part shark's best friend -- thanks to their habit of getting rid of painful and annoying parasites. The baby pilot fish swim near swarms of jellyfish and near drifting seaweed. These carnivorous fish eat only meat and live on smaller fish, squid, cuttlefish and many types of crustaceans, including crabs. Morays resemble snakes or lizards but these creatures are actually large, slender fish. When they are kept in marine aquariums with other reef fish they often make meals of the other fish in the tank. Very bashful, these fish live secluded lives, hiding among rocks and crevices in the deep ocean waters. Several sharks call the Bahamas home, including the blacktip shark, blacktip reef shark, bull shark, scalloped hammerhead shark and Caribbean reef shark. These large fish have very sharp teeth and few are the fish that sharks don't eat. These sharks have a wide range, spreading from the coasts of the United States to Bermuda and the Bahamas.